Product prices and availability are accurate as of 2019-04-10 08:47:25 UTC and are subject to change. Any price and availability information displayed on http://www.amazon.com/ at the time of purchase will apply to the purchase of this product. This easy-to-assemble wooden stand allows for convenient storage! 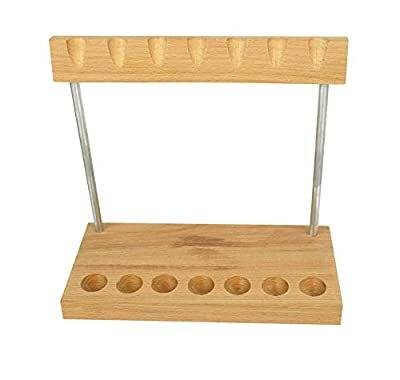 This quality, seven piece hammer stand is the perfect accessory for your craft hammers. Sturdy steel and wood construction means that this hammer stand will last a lifetime. Organize your hammers on your craft bench. Never again hunt around for the right hammer. The vertical stacking system allows hammers to be placed handle down, keeping the head in the air to avoid accidental damage to expensive hammer heads. Attractive, all real wood and steel construction compliments your hammers. Some minor assembly is required. Measures approximately: 7-1/2" tall x 7-1/2" wide x 3-1/2" deep. Holds seven jewelry and craft hammers. Quality wood and steel construction. Organize your hammers and have them accessible at all times.